I had my first meat pie during my brief stint in the SCA, a group of very fun people who completely re-enact medieval times (I loved sewing my own garb!). People would make them ahead of time, wrap in foil and refrigerate, and then we’d heat them by the fire whenever someone got hungry. They were awfully handy and awfully good. 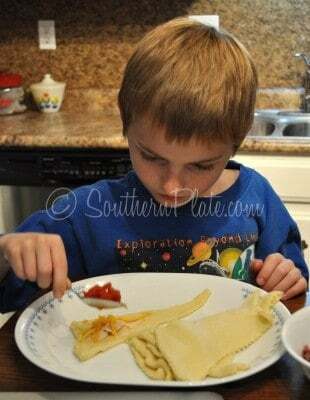 So when Brady goes on camping trips this is the first recipe I go to for convenient food to take with him. The options are endless and I hope you’ll use this one as a springboard and get creative to suit your personal tastes. I’d LOVE to hear about your combination ideas in the comments section! These also make a fun supper for those rushed evenings when you have to head out the door as soon as everyone gets home. They’d work for family movie night or just a lazy evening meal as well. Ready to get cooking? 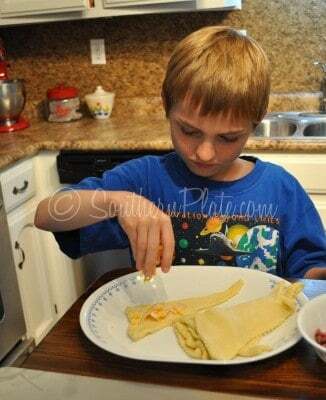 This is another great recipe to make with your kids or just let your kids make all on their own. Brady is going to help me with this one. He’s quite the cook! Today I’m using deli roast beef, deli chicken, mozzarella cheese, and cheddar cheese. 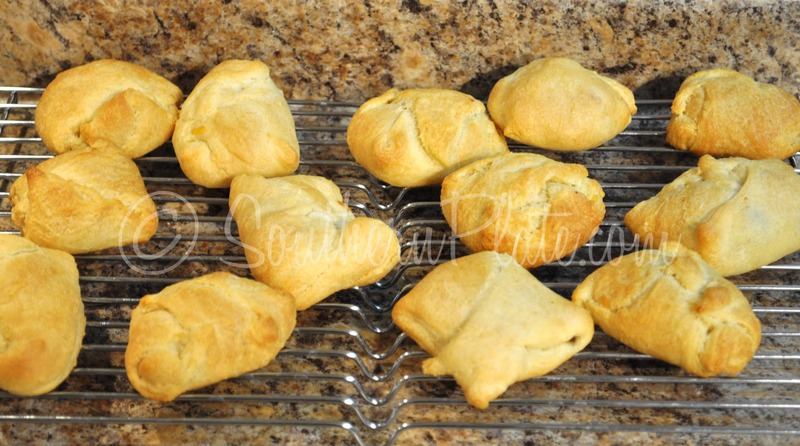 You’ll need some crescent roll dough to seal it all up in and as you can see I grab whatever I get to first. What else can you think up? Lets brainstorm together in the comments! 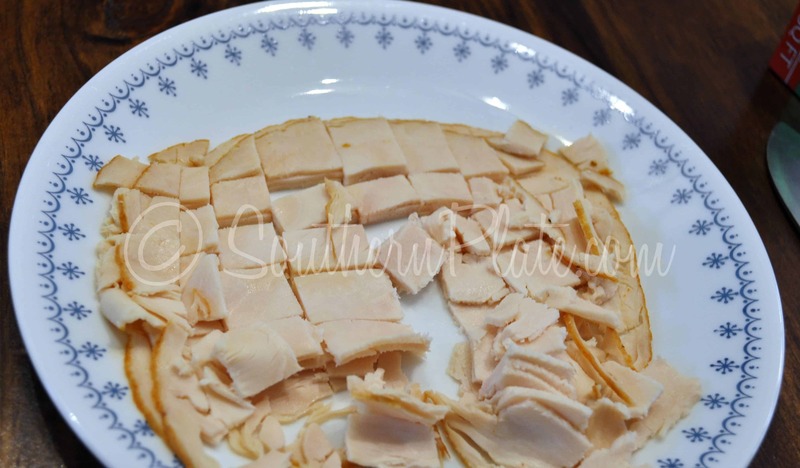 I pull out a few slices of deli meat and give them a good dicing up . Now open your crescent rolls and separate them all out like this. This is best if your dough is really cold. If you let it sit at room temperature it gets very sticky and stretchy and harder to work with. Place a bit of meat in the center of each crescent roll as my chief assistant is doing here. Sprinkle a bit of cheese over the top. 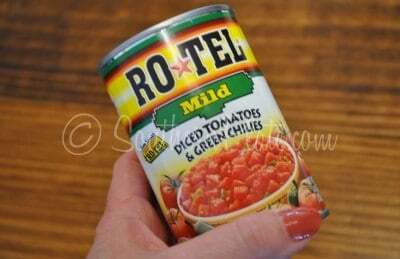 If you are going to use Ro-Tel, make sure you drain it well and then add that, too. Ooh, chopped green chiles would be good in this! 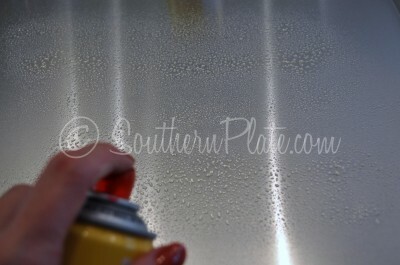 Then fold the edges over however you can to get it all sealed up. These are Brady’s, didn’t he do a great job? mine usually end up looking like little round packets. Bake them at 350 for ten to fifteen minutes (mine take about thirteen), until browned. Allow to cool completely. Im’ using a cooling rack but you don’t have to. If you’re having these for supper, you can just eat them right now! 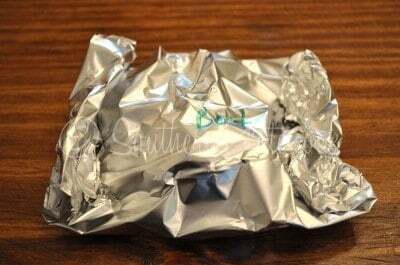 Once completely cool wrap each one in foil and write the filling on the package so folks know which one they’re about to eat. To be honest with ya (I really hate that phrase but I’ll get to why in a minute*) I have no idea what is in this packet because I made them all at once and didn’t keep up. I just wrote “beef” on it as a little visual example. Whoever bites into this one has a 50/50 chance of getting beef and I figure those odds are better than most! 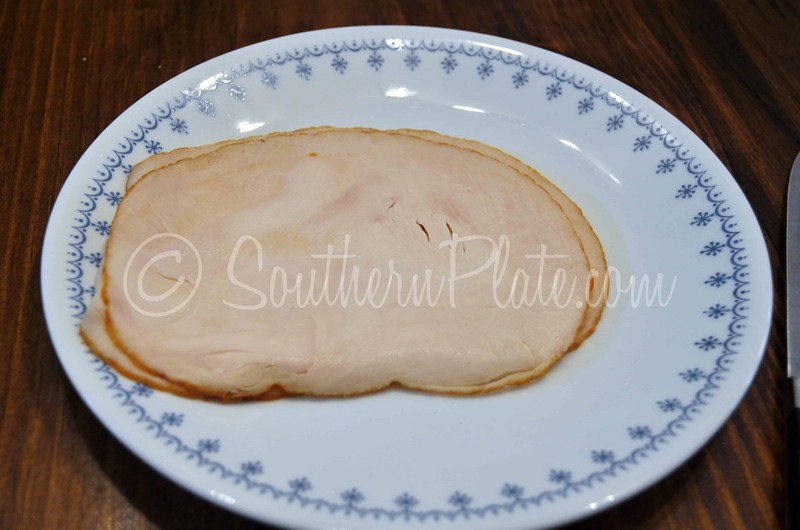 So you might want to cook them separately, make all of one variety first and then move on so you know what is what. So now I gotta go repent for saying it myself. Place in a zipper seal bag and put in the fridge. Before heading out, place this bag in an ice filled cooler. At the campfire, simply place at fire’s edge or over hot coals until heated through. If you are having these at home, just eat ’em! You can refrigerate them and reheat in the microwave as well, don’t fret with the foil, I toss them all in a zipper bag unwrapped for the fridge. These chicken, cheese, and Ro-Tel ones are my favorite. 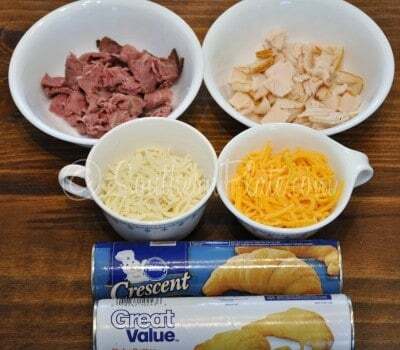 For each little pie you’ll need about 1 heaping tablespoon of chopped meat, 1 tablespoon of shredded cheese, and 1 teaspoon to 1/2 tablespoon of sauce or other add ins. Make sure you leave plenty of room at the edge to seal packet. 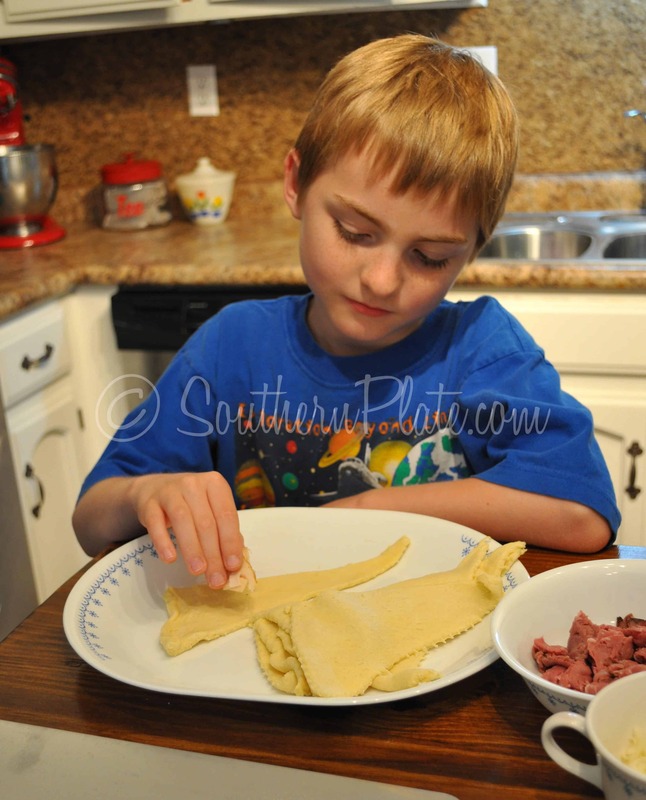 Roll out chilled crescent roll dough and separate into triangles. 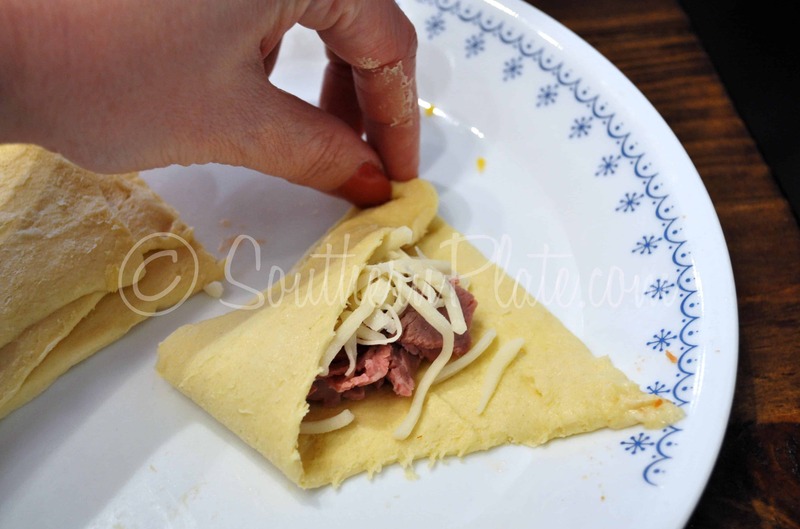 Place meat, cheese, and other add ins in center of each triangle and fold dough over to seal. Bake on greased cookie sheets at 350 for ten to fifteen minutes, or until lightly browned. Serve warm if you like or allow to cool and wrap each individually in foil. 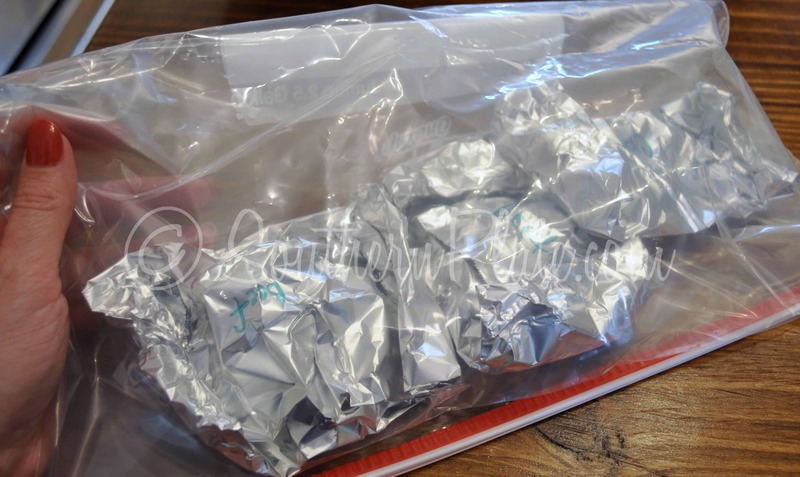 Refrigerate foil wrapped sandwiches and place in zipper seal bag in cooler for transport to campfire. Heat at fire’s edge or on coals until heated through. 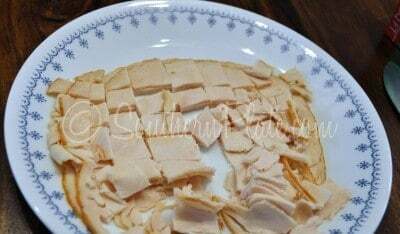 With a lot of folks planning camping trips this summer, I’d REALLY love to hear your ideas for add ins in these little sandwiches in the comments section on this post! Submitted by Ruth Lail. 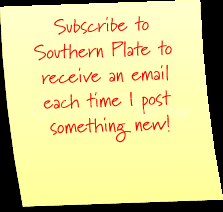 Brighten our day and submit your funny or uplifting quote here! I make these with taco meat and a shredded Mexican four cheese mix. OH WOW THAT SOUNDS SO GOOD! I was just going to say Tacos!! Sounds sooo good. I would probably do my own pizza sauce, pepperoni and other pizza type toppings. These look great! That is so cool! I’ve never heard of these before, but I can think of so many handy ways to use them. They’d be just as good cold, I think! Great idea for packed lunches, fishing trips, and long car rides. Thanks so much! Ooo, Melanie…the school lunch idea is stellar! 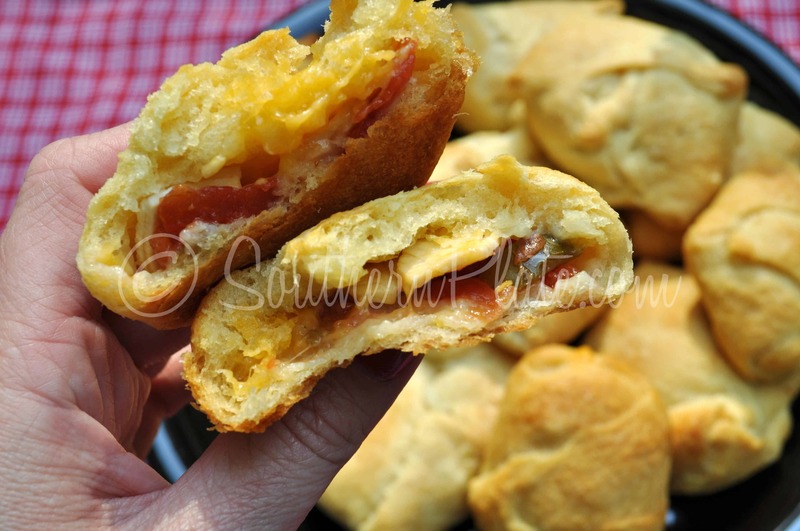 Could you make these like pepperoni rolls? I am thinking yes…. I make these all the time as it is a family favorite. I mix sour cream, cream of mushroom, and cooked chicken together then fill my crescent rolls. They are DELISH! I’ll have to try the Taco meat version for sure! O YUM MIE this one sounds awesome!!! These look so good! I’m thinking some chicken, broccoli, cheddar cheese and a bit of alfredo sauce would be so yummy. This was my first thought. You could even go veggie and have spinach/broccoli and mushroom with the alfredo sauce. How about making a breakfast version with cheese and bacon? That would be good. 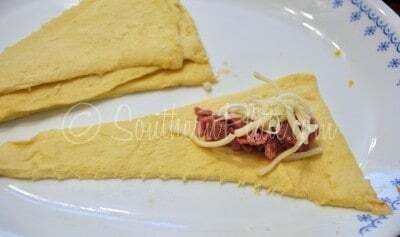 Add scrambled egg if eating them at home. Whatcha think Christie? I don’t know what Christy thinks, but that sounds delish! Definitely making them this weekend. I think leftover meatloaf would be good in there too. I like the taco idea! 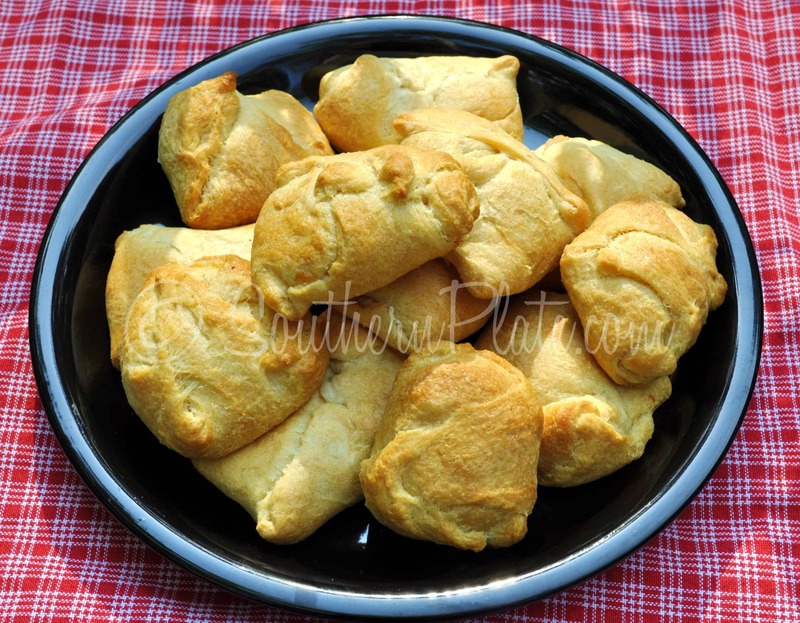 These would be good with scrambled eggs, crumbled bacon and cheese for a breakfast pie. Add some rotel or chopped green chilies for a bit of a kick. How about pepperoni and mozzarella? Canadian bacon, pineapple tidbits and pepper jack cheese? How about dipping sauces? BBQ sauce, pizza sauce, spaghetti sauce, honey mustard, ranch dressing… all straight from the jar. 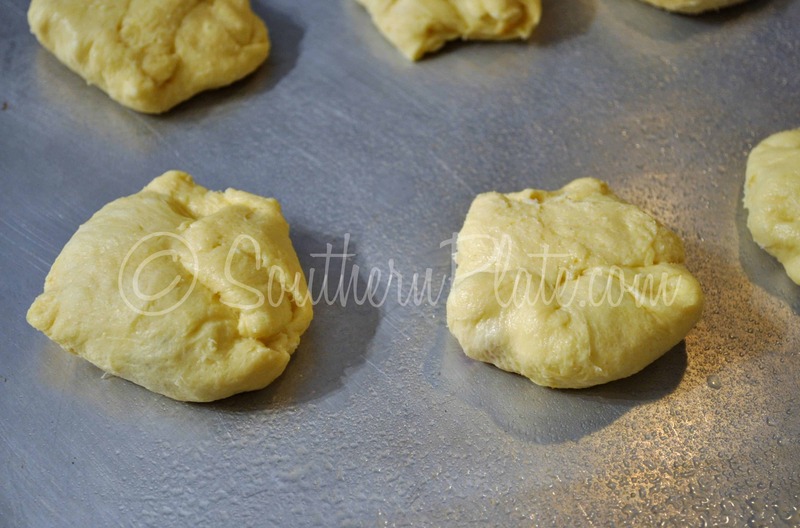 If you don’t have crescent roll dough you could flatten canned biscuits for the crust. 1. Ham and cheese with chopped broccoli. 3. Leftover chicken or pork bits with chinese style veggies and teriyaki sauce. 4. 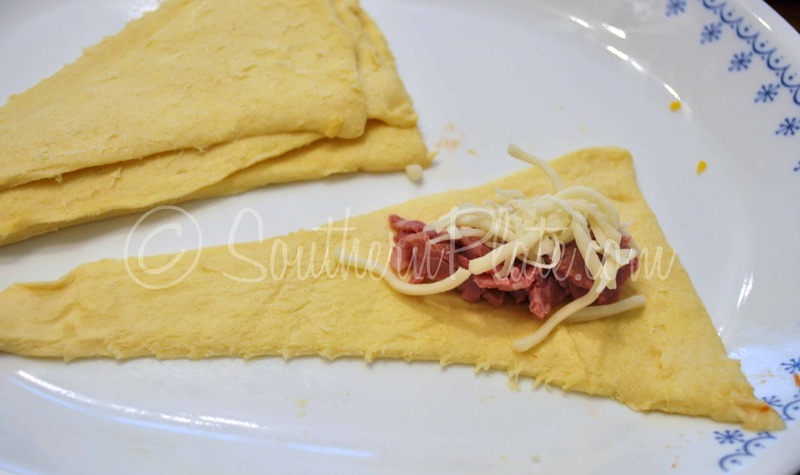 Corned beef, swiss cheese and a spoonful of sauerkraut. I think it would be great to put fruit in some of them and then you would have dessert too. mmm…how about chopped apples tossed in butter, brown sugar, and cinnamon? Yum! Hot dogs! You could dice them up and put cheese or some chili with them. All the different fillings sound yummy! I’m definitely doing this one! I had another thought or two. How about scrambled egg, feta cheese, and spinach for Greek style or scrambled egg and bacon and cheese for American style. I could even see tossing in a spoonful of the shredded style hashbrowns. 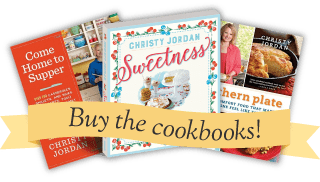 We could even go on the sweet order and use canned pie fillings or peanut butter and jelly. I am just thinking the possibilities might be endless. I’m going to try these with Rotisserie chicken. These look super good! 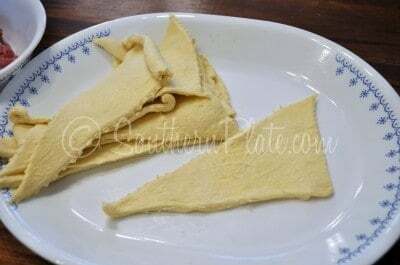 We have these on vacation with crumbled sausage and cheese, and everyone loves them. You can also shape the sausage into little oblong patties and then they are easier and tastier when placing into the crescent roll. Awww, your little conversations with Brady tugs at my heart. ;D What a sweet boy. Yeah, they grow up too fast. And, I love the great recipe too. The fillings are limitless. I think it would be a great way to use left-overs. These sound yummy. I really like the idea of the taco meat filling, as well as the chicken and mushroom soup. My first thought was a casserole that I make. It has ground beef, onions, frozen mixed vegetables and cream of mushroom soup in it. That might be something I’ll try…. almost like a portable potpie. My mother-in-law has made these for years but with Grands biscuits, browned hamburger and cheese. We have been talking about coming up with different ideas but never do. Thanks for all the ideas. We will definitely try some of these. Oh these sound so good. I am going to Publix today to get my ingredients. What about cheeseburger pies? I have made something called a cheeseburger ring from a Pampered Chef recipe that uses the cresent rolls & it has ground beef, shredded cheddar cheese, ketchup, mustard, onions mixed together & sliced american cheese on top of the mixture. Thanks so much for this Christy! We do these too except we put them in muffin pans to cook. They are a great snack or appetizer. You can do so much with them. I make somthing like these for my family except I use canned biscuits. 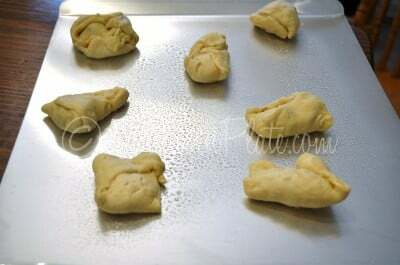 Just roll them out a little and either fold them like a calzone or fold the dough into the center, like you did. These are great and fast. These look great! I’ve made similar things with ground beef, bbq sauce and cheese and then two refrigerated biscuits sealed around it. Also an appetizer that was a small chunk of cream cheese with chopped up olives (like the jar kind for muffalettas) then wrapped up like this in a crescent. They were both wonderful. I’m inspired now to try more variations. How about a nice dessert to go along with the sandwich stuffings. Make some with chunks of chocolate or a little chocolate chips….